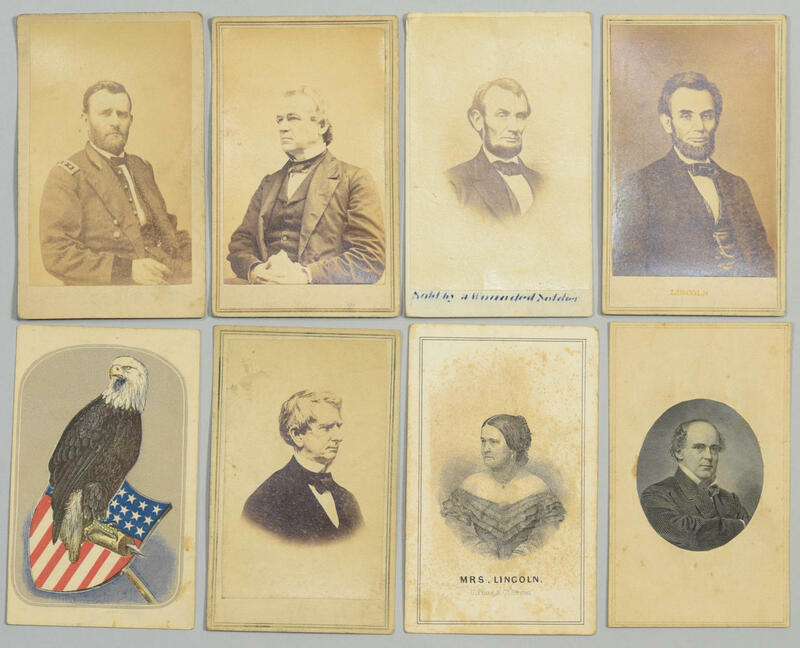 Collection of 8 Civil War and TN related carte de visite cards from various studios, including 2 of President Abraham Lincoln, 1 of Mrs. Lincoln, 1 of President Andrew Johnson, 1 of Treasury Secretary Salmon P. Chase, 1 of President Ulysses S. Grant, 1 of Senator William Henry Seward and 1 portrait card depicting the "Old Abe" or Live Eagle, the symbol on the flag of the 8th Wisconsin Regiment. All measuring 4" H x 2 1/2" W. Provenance: Private Warren County, TN collection. CONDITION: Minor toning, some spotting and wear to edges.